If you have a business supply store, retail outlet or catelog, I highly recommend you consider this product, CloudNet360. Here’s what I think is the best web-based truly free DNS testing website and ping tool there is. Many misleading websites out there that show up in google when searching for worm scanners and malicious code scanners, but not too many out there for websites. Most of them have software to be downloaded. I needed a quick web-based tool so tried a few and settled on this one. Sure, you can use all of these “cheat tweets” as I call them where you can get 100 followers a day or 19,990 followers a month, whatever dude. What’s really important to a business owner (like me and probably you) is that we get “targeted” followers rather than a bunch of competitors following us, for example. 8 pages of profiles popped up on screen at 20 per page. I could see the word “author” in their bio so I would scan their basic description and consider if each was a potential target for future business. Here are 3 very crucial discoveries I made after that point. 1) I didn’t want to connect with just everyone with the word “author” in their bio. 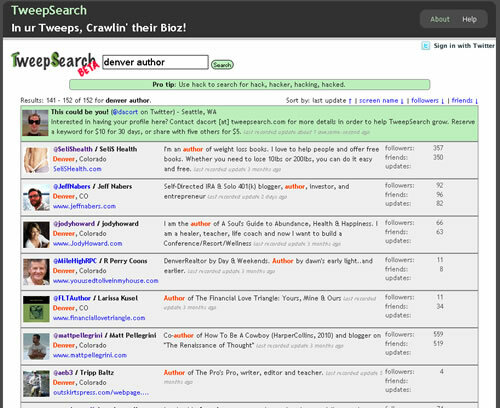 TweepSearch gives you enough of the bio where you can really tell who you want to follow and who you don’t. Like, someone who has no posts is a red flag to me. They don’t even want to participate on Twitter, so why connect with them? 2) Posts from the person I was newly following began appearing immediately on my Twitter account page, so I was prompt to respond. And, this action almost always resulted in a return follow. I could just sit there and watch my followers number go up! Interaction and replying to other peoples’ posts is so crucial! 3) Anyone I saw that had nearly no posts/contributions to Twitter, I bypassed as well. These are people who are glad to receive a follow but are only promoting whatever is in their profile page or bio. Twitter is supposed to be to meet people and be interactive with them. You and I don’t have time to waste on those that don’t understand the idea of getting to know people using social media. TweepSearch.com is really a tool everyone on Twitter should be using. But, I’ve only heard about now by searching specifically for a tool to help me search for keywords with peoples Twitter “bios.” Twitter’s main search feature only searches post content. Real-time search engines like Collecta.com also only search through post content. But, when you and I are trying to network for potential leads, we need to search for peoples’ bio info by keywords. Give it a whirl and let me know how it works for you. Here’s a nice little script for those lazy moments where we just don’t want to open up MS Word or Open Office to dump our sentences into a document just to calculate the number of characters. I’m not quite there yet, but by the end of the month, I surely will have 2000+ followers on Twitter. It took me a while to learn how the big boys Tweet and I think I’ve got it now. There are a few tools to use, a few things to automate, and a few tricks to get you ahead that not a lot of people are talking about. But, I’m going to divulge the secrets right here for you for free in thanks to all the people who have helped me for free with my own Twitter journey. Get a free account at TweetLater.com – Certainly one of the most essential Twitter tools available, here you will be able to add a setting to automatically follow anyone who follows you as well as create automated posts ahead of time. Here’s a screenshot to show how a post is added and scheduled for delivery to Twitter in 5 steps. Plan for 3 sets of 5 Tweets minimum per day – You won’t have to do this forever. Remember, we’re just trying to get you to 2000 followers within a short amount of time. Use your TweetLater account to add scheduling Tweets so that you hit 3 different groups of people at different times throughout the day. I usually focus on the 8:30-10am, 2-4pm, and 8-10pm crowd. Use IFollowBack.com – This free utility allows you to see profiles of Tweeters who agree to follow those who are willing to follow them. So, by simply going through one profile at a time, you can find people who you are interested in following or who might prove to be even potential customers for you. The prerequisite for being part of this rather secret program is that you have to be willing to follow others who choose to follow you. Geez! Pretty harsh ‘ay? Just goes to show that not everyone grasps what Twitter is really about. It’s about exposing yourself to a larger amount of people than you could ever meet for the same price FREE! Use FriendOrFollow.com – This free tool allows you to see all the people you are following who are not following you. Sure, someone might follow you initially but they can “UNfollow” you anytime they want to. You will need to delete several unfollowers so that you have room to follow others while on your way to acquiring 2000 followers of your own (people following you). I’ve been suggesting for a while now that using Twitter is a great way to get started on the Internet without spending a penny. If you use those five components together, you will be on your way to getting 2000 or more followers on Twitter. Twitter as a tool in itself is fascinating but the number of tools people are making to work with Twitter is completely staggering! Almost every day I hear of a new Twitter tool to help you conglomerate your tweets or link to some other social networking site. Here I will list all the Twitter tools as I discover them and provide a little explanation of them. Pick and choose what Twitter tools will help you the most. Twtpwr.com Twitpwr.com (corrected) is Joel Comm’s program for rating your Twitter influence by monitoring the Twitter traffic you generate + users you refer + how much traffic THEY generate. Submit your url for tracking. Whirl.org is a desktop application to let you know if someone is Tweeting you without your having to visit Twitter. Tweetdeck.com [My Favorite So Far] This tool is much more my style. It opens up to a full screen and shows your current Tweets, replies and direct messages in 3 separate columns. I can have Tweetdeck up all day on a separate screen and just occasionally scan through tweets–kind of like IM. Twollow.com follows tweets for you by keyword sort of like how Google Alerts works. 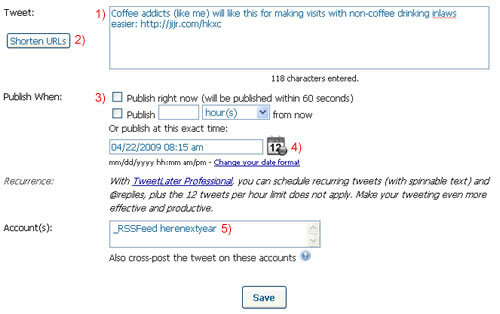 TweetLater.com schedules tweets to hit peak times that your followers are online. Twitterific is a widget for MAC’s that allows you to view and post tweets without the use of a web browser. Digsby.com helps to manage all your social networks from one software. Twitbacks.com helps you make a nice Twitter background for your profile free. Last week I made a Camtasia video and sent it to a client. No problem. Camtasia worked just fine. Today, I started working on the instructional videos for our new HereNextYear member site (in soft launch…more about that later) and about every 5 seconds was this annoying little squeak that sounded like a really bad turntablist in a rap band pushing the record backwards to make the annoying squeak! After a couple of hours of researching this, I finally come to find these squeaks are as a result of the new Flash player version 9. Apparently Camtasia videos do not play well with the version 9 of Flash Player. I must’ve just randomly clicked on a Windows update or something. Anyway, if YOU use Camtasia for recording screenshots or live demos (still the greatest recorded presentation I know of), go watch this video and then you will find the free download link that will fix the problem. Essentially, here’s how it works…. From there, your video will be fixed and you’ll need to re-upload it to your website if that’s where you are hosting it. Pretty simple…just took me a while to find the solution online. For all you Camtasia users, hope that helps a bit. Or, you could of course just upgrade to version 6 of Camtasia where the fix is included.